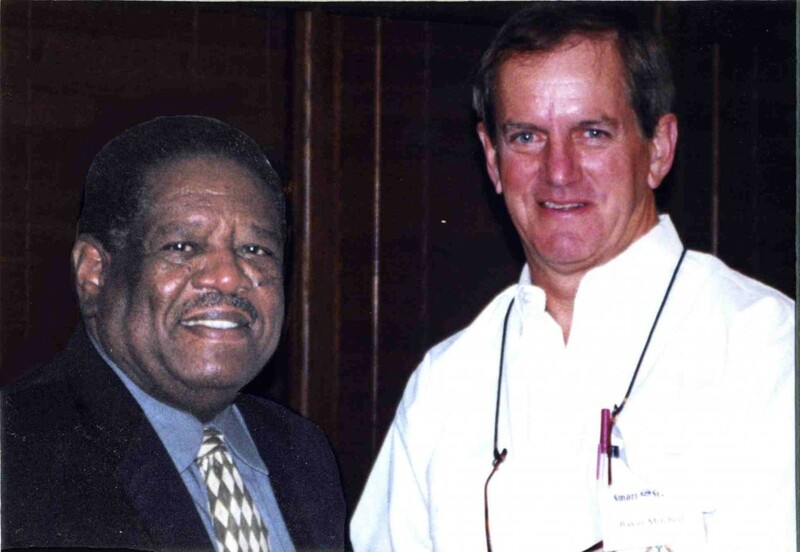 Dr. Thaddeus Lott and RBA Founder, Baker Mitchell. Dr. Thaddeus Lott was a heroic principal in Houston, Texas, who pioneered the Direct Instruction educational model used by The Roger Bacon Academy, Inc. (RBA) and the 2,100 students and four public charter schools and it serves: Charter Day School, Columbus Charter School, Douglass Academy, and South Brunswick Charter School. Dr. Lott passed away on October 26, 2015. RBA distributed the letter below as a tribute to Dr. Lott. Feeling sadness and deepest respect, we inform you of the passing of Dr. Thaddeus Lott on October 26, 2015. Many of you drive “Thaddeus Lott Lane” daily when bringing your children to school. Dr. Lott was a heroic principal in Houston, Texas, who pioneered the Direct Instruction educational model used by The Roger Bacon Academy, Inc. (RBA) and the four schools and 2,100 students it serves. Dr. Lott’s family would greatly appreciate hearing more about how his work continues to change lives in North Carolina. We encourage any of you with a story about how you or your child has been enhanced by the RBA educational model inspired by Dr. Lott to email a brief summary—or even a note of condolence—to RBA’s Public Information Officer, Sawyer Batten, who will compile these and send them to Dr. Lott’s family. Please email your stories to her at sawyer@rogerbacon.net, by November 5. We have compiled a brief list of “highlights” to acquaint you with Dr. Lott’s work and character, in hopes that you will take a moment to read below. The education your child received today is an aspect of his legacy. Became Principal of Wesley Elementary in Houston in 1975, where 99% of the students were minorities and only 18% of third graders could read on grade level. By 1980, Lott had increased that number to 85%, which climbed to 100% in 1996. Held fundraisers and rejected his district’s technology upgrades in order to purchase the Direct Instruction curricula responsible for his students’ success, as it was not on the state’s list of approved materials and thus was not funded. So improved education that in 1995, parents from neighboring communities who wanted a “Wesley Elementary” for their children, petitioned the Houston school board allow Lott to take over three blighted schools in the area. This was granted, and they created the first charter school district in Texas. Withstood constant bureaucratic and public scrutiny. Rather than embracing the success of Lott’s students and the methods behind it, Lott’s school was punished in the media for being “too good” and exposing critical flaws in the state system. Instead, Lott was the target of a failed investigation to prove his students were cheating on state tests. Earned a nationally-aired 20/20 documentary about the proven and dramatic success of his model, as well as his tirelessness. Changed the lives of thousands of children in Houston. So profoundly inspired a former engineering professor who was volunteering at Wesley, that the man, Baker Mitchell, came out of retirement in 1998 to replicate Lott’s model in the newly-established charter school environment of North Carolina. His work continues to change the lives of thousands of children in southeastern NC. The establishment of The Roger Bacon Academy, Inc. (RBA) by Baker Mitchell in1999—a company that provides public charter schools with the educational model pioneered by Dr. Lott. RBA’s recruitment of one of Dr. Lott’s teachers at Wesley Elementary, Ms. Barbra Jones, who now serves as the Headmaster of Douglass Academy in downtown Wilmington. Four schools and 2,100 students who are served with this model in southeastern North Carolina. Charter Day School, established in 1999, consistently being the top scoring elementary and middle school in its surrounding district on state End-of-Grade tests. Most recently, the school outscored the district by 20 percentage points. Columbus Charter School, established in 2007, consistently being the top scoring elementary and middle school in its surrounding district on state End-of-Grade tests. Most recently, the school outscored the district by 20 percentage points. Douglass Academy, established in 2013 and serving a 96% minority population, having 100% of its third grade class pass the most recent state End-of-Grade tests. South Brunswick Charter School, established in 2014, to expand access to the successful model to more families. The new school will take its first state End-of-Grade tests at the end of this year. Kindergartners at the four schools to be able to read by January of their first year of school. In 2009, The Roger Bacon Academy (RBA) used the Direct Instruction reading model to remediate students who had fallen behind in district public schools. The program included 17 students in grades 4-8. In three months, with only nine hours of instruction, 13 of the 17 students had been brought up to or above grade level. The remaining 4 students had progressed even further— an entire year ahead. If you’d like to send a note to Dr. Lott’s family on how his efforts to improve education are living on here in North Carolina, please email your message to sawyer@rogerbacon.net by November 5. If interested, please read more at the link below. Teachers and parents will find many nuances of Dr. Lott’s practices familiar http://www.hoover.org/research/no-excuses.